2013 is upon us, budgets are locked and people are looking forward, with great anticipation to the rewards 2013 will surely bring. Many look upon a new year as an opportunity, a time to make adjustments, course correct, set goals and focus on the positive. In my house, one is graduating college, he will get a job (that is the plan, anyway). One is graduating high school, he will go to college and the third will be firmly entrenched in middle school (the teenage equivalent to purgatory). As far as predictions go, if we really want to go out on a limb, we should focus on 2014, 2013 is too easy (it is after all, already here). Why look further out? A lesson learned from my dad when I first learned to drive, “focus a bit further ahead”, he would say,” it makes the experience much smoother for your passengers”. It makes logical sense, make slight course corrections as you go, but generally look as far out as you can. Much of what will happen for the next few months was determined by our actions at the end of last year. I plan to work hard in 2013 and try to keep the right as smooth as possible. From a predictions standpoint, I am going to skip 2013. Cloud – Maybe, just maybe, we will realize that cloud computing is really an extension of a concept created in the 1950s, but the time has come. Everyone will realize that Cloud Computing is simply a metaphor for the things I need computers to do. I need storage, to store stuff, I need CPUs to compute stuff and I need to do both of these things a lot. Deciding to extend your enterprise (personal or company) to the cloud is a business decision that frankly comes down to economics, governance and law. Hence, this will be the job description for the CIO; to evaluate the economic and legal benefit of renting compute time versus buying a computer. The default position for IT will be Cloud first, then On-Premise. Definitions/Buzzwords – Sadly, it will take another year or more before ‘Social’ will no longer be an important prefix to every business and technology term we have been using since the 1950s. This includes, but will not be limited to: business, customer, marketing, monitoring, networks, CRM and media. We will no longer feel the need to append the suffix ‘Cloud’ on: private, personal, hybrid, open, nor elastic. ‘Cloud’ might just going back to being something related to weather. ‘Mobile’, everything will be mobile, so it will lose its luster and appeal as a descriptor. Influencer will take a backseat to real world Friend. Airplanes – We will fight for the use of mobile phones on airplanes and the wish we didn’t. We will most certainly become very annoyed with the ringtone in the seat next to us, almost as annoyed as with the person trying to have a conversation talking loudly and saying “WHAT” in order to overcome the engine noise. My last bastion of a ‘leave me alone’ place will be lost. This will make us sad, then angry. By 2015 is that certain flights (like New York/Boston or San Francisco/Seattle) will be designated as NO cell phone flights, like the “quiet car” on the commuter rail. CMO/CIO – Hatfields/McCoys, Yankees/Red Sox, Barcelona/Real Madrid – ok, maybe not that bad, but you get the point. The CMO has a job to do and has enjoyed the freedom of SaaS. Shadow IT is still going strong, but the CIO is doing their best to gain some control, without appearing to be controlling. The CIO has a tough job, as does the CMO. The best path to success is to work together. The key driver here is going to be the sheer volume of data (buzzword avoided) required to gain a competitive advantage. The CMO will not be able to go it alone, they will need help. Yes, the CMO will have a much greater purchasing authority, possibly surpassing the CIO for technology; but they will need some help. Frenemies to the end! Customer Centric – Companies who do not put the customer front and center, understand their jobs-to-be-done and learn to co-create value with their customers, through value-in-use will not be doing very well. This is what customer centricity is about. We will spend 2013 talking about it more, trying to understand it better and ready to execute in 2014. Disruption – Something not even on our radar will cause major disruption. It is hard to say exactly what this is, or will be, but it is lurking, waiting to pounce. If I knew exactly what it was, I would be planning for it. The word for 2013 is ‘Context’. Context will help (me at least) in the transition from what and why, to how. I will be spending a lot of time in 2013 working to understand the proper context of, data, information and timing; mostly to determine relevance. If you would like some help getting from here to there, feel free to give me a call! Is the Office of the CMO the Right Place to Drive Customer Engagement? Primary sourced research is valuable, adding one’s own interpretations (which I will) is the added benefit of blogging. The most recent IBM research “From Stretched to Strengthened – Insights from the Global Chief Marketing Officer Study” (URL) is a good read. Research based on CMO conversations is arguably meant for a CMOs. As usual, I found myself considering this from a different perspective. The question which kept popping into my head was whether the office of the CMO is the right place to drive the call to action suggested by the report. I am not it sure is, there, I said it. The CMO should be part of the team, but not the leader of the team. I believe that the research needs to be read by others within the organization as well. Being brutally honest, I agree with the first, not so sure about the second; at least not in the way the company will make it happen. Finally, while I agree results need to be measured, I am not sure what “capturing value” is about (in this context). The message that keeps hitting the reader over the head is that CMOs are more than a bit nervous regarding the new, cool ‘socially’, stuff and are now concerned about the amount of data coming their way; because of all this new stuff. There is a bit of parroting going on as well, talking about engagement, but, in my opinion, not a clue how to actually do it. Seasoned marketers are having a toug h time understanding social media and are concerned with multi-channel initiatives (called channel choice, just wait until they try to solve cross-channel) and are unprepared for shifting customer communication preferences. I suppose that I should not be too surprised by some of the findings, as the areas of concern are relatively new (3-5 years) and were not top down initiatives; they came either from the bottom up, or from customers themselves. Traditionally, marketers look at markets, while Customer Service talk to customers (Figure 6 in the report proves the point). How do you convince a CMO who has “Data explosion” at the top of the list of concerns to speak with and listen to individual customers? Without a doubt, the more customers you connect with, the more insights that can be gleaned. But, that does of course mean a whole lot of data, no? Please, do not get me wrong this is critically important, but hard. The CMO cannot do it alone, nor should they try. How are you gearing your ‘teams’, programs and processes to understand individuals and not just markets? Which tools and processes are you investing in to better understand and respond to what individual customers are saying and doing? How do you safeguard your customers’ data and privacy in a multichannel, multi-device world? Yes, the intersection of business process, CRM and contact centers is the future of customer experience. The umbrella term is Business Technology. These core elements are the center-piece of the contact center, now and in the future. The companies who get it will be sharing the responsibility of delivery, and there will be a person accountable for the results – not likely to be the CMO. Does this map to earlier research? An earlier IBM report, which I also wrote a post about (The Perception Gap), shows that many organizations are missing the point. “Customers do not want a relationship with your business, they want the benefits a relationship can offer to them”. It is clear to most people that talking is not the same as engaging. Here is what I think is not so clear, listening is NOT the same as engaging. Active listening maybe, proving you heard what was said (by actions and words), now that is engagement. It begs the question: are the CMOs really the ones who are going to engage? If the objective is really about helping customers to enjoy the products and services they have just purchased and your desire is to collaborate and to co-create new products and services, is the CMO the right person (office) to lead this charge? I would say “No” because marketers are used to looking at markets, not engaging with individual customers. I am sure I will get a lot of flack for the blasphemous comments, but I ask you to consider it for a moment. 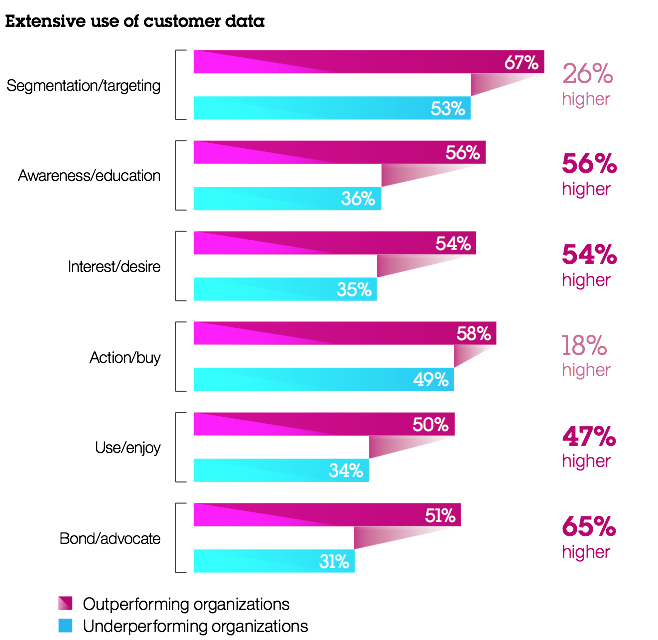 In the image to the right, the report suggests “Outperforming” organizations “invest more effort in capturing and using data to foster customer relationships”. Yes, the data does suggest that to be the case. However, they also invest more effort in Segmentation/targeting as well as Action/buy and I am hard pressed to see conclusive evidence suggesting which one of the investments is driving the success. Given what I like to talk about, write about and analyze, I would like nothing more than for the chart to prove a causal relationship. However, it does not answer to the needs of the customer either (this is an inside-out versus outside-in perspective). 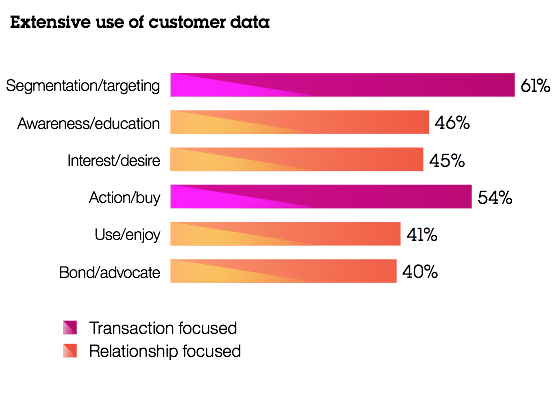 The previous IBM research paints a different picture of what the customer wants (or at least what they say they want). Back to my core concern, do you trust the CMO to make the required changes to meet the customers where it will work? If you are the CEO, are you driving the CMO in the right direction? Or, if you are the CMO, does it make more sense to get a bit closer to the contact center and work together to properly engage with the customers on their terms and offer the real value that they are looking for? (Too harsh?) It is always possible that my comments are also too myopic coming from the other direction, but I am not convinced that is the case.